Ties that make music are usually tinny, cheap novelty affairs, they probably play Jingle Bells and have LEDs on them as well. 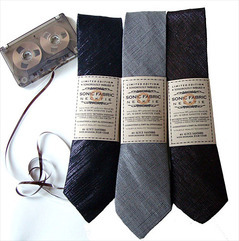 So it’s a pleasant surprise to find a musical tie that’s actually quite a classy and haute proposition. It’s the musical tie from Sonic Fabric made with 50% polyester threads and 50% the spool from tape cassettes, there’s not a plastic battery case or tinny recording of Happy Birthday in sight. Rather like an instrument, the whole fabric creates a sort of music when you draw a tape head over the surface of the cloth: Listen to the music on the site – it’s half way between scratching a record and a windchime. The makers in New England can embed different sounds or tunes in your tie by recording on the tape before they use it to weave with. The cassette tape gives the fabric a metallic sheen, and it can be used for anything from dresses to curtains. Though I rather imagine it’s not machine-washable. These limited-edition ties are made in collaboration with designer Julio Cesar. They are intended to impart the wearer with special, subtle powers of perception and attunement, and to emit an intangible sense of the miraculous. Available in skinny (2″) or standard (3.5″) in black, grey or dark brown.